A halo (ἅλως; also known as a nimbus or Gloriole) is a ring of light that surrounds an object. 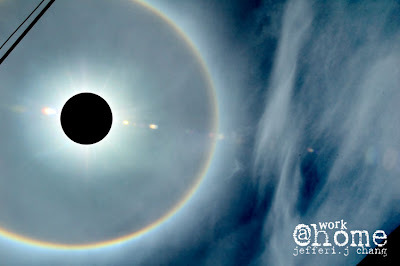 Halos, also known as ice bows, are optical phenomena that appear near or around the Sun or Moon, and sometimes near other strong light sources such as street lights. 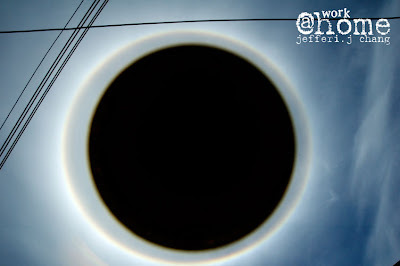 There are many types of optical halos, but they are mostly caused by ice crystals in cold cirrus clouds located high (5–10 km, or 3–6 miles) in the upper troposphere. The particular shape and orientation of the crystals is responsible for the type of halo observed. Light is reflected and refracted by the ice crystals and may split up into colors because of dispersion, similarly to the rainbow. Sometimes in very cold weather optical halos are formed by crystals close to ground level, called diamond dust. The crystals behave like jewels, refracting and reflecting sunlight between their faces, sending shafts of light in particular directions. Atmospheric phenomena such as halos were used as an empirical means of weather forecasting before meteorology was developed. I found out it not easy to shot any photos that include the sun with a dSlr camera. One has to be very careful not to look directly at the sun or risk your eyes gone blind. The lens feature in dSlr lens can direct into your eye receptors and injured it permanently. So, i have to be careful not to look directly to the sun too long. 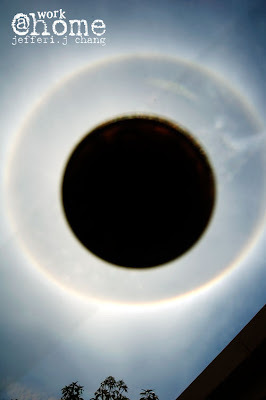 Then i thought of an idea of what every sun astronomers do by putting a black object in the middle to cover out the sun. Thou, this is not the safest way because the risk of looking directly to the sun with the lens still there. I have to snap the sun very fast and most of the shot not really aligned well. The photo above was taken directly using the camera. I had to shot it fast and not directly focus on the sun. The black round was added after that using photo shop. The photo above was taken with a 10 cent on top the lens. I can put the coin on the lens because of the attachment filters and i don’t have to worry of scratching the lens. Still i need to be careful to avoid looking direct to the sun. The sun halo looks better and clearer after post processing using the photo shop. It to believe the ring should be like rainbow and not a white line due to the definition from wikipedia. I use a smaller coin that is 5 cent for this shot. I tape the coin on a silo tape and attached it at the center of the lens. Now, the black point look smaller and one can see the ring better. This is not any professional astronomy shot but merely a photo testing from me of a phenomenon that my friend woke me up for. Thanks for that! I believe lots of people saw and photograph this phenomenon. Here i listed some blog that wrote about it in instant and post it in their blog. Bits of Life: The sun is magnificient, surrounded by halo-rainbow!! hehehe… sa hiran, this phenomena not once in the life time bah.. always happen but no ppl aware.. i saw it happen many time..
but i dont say anythig at office cos they had a different tot about that.. ada yg bilang, they saw a face la, ajaib la, if u zoom can see UFO la… bla bla la.. so i just ignore it.. (i think thats effect of the angkasawan ngam2 launch kan) hahaha.. Funny.. Funny..
anyway.. nice photoshoping.. i like the background (skies) color.